This problem is known to as the neural correlates of consciousness. What is the minimal amount of neural activity necessary to produce conscious experience? Why do different types of brain activity give rise to a subjective sense of existence? I found myself entertaining the idea that if computers were to have conscious experiences, because different systems have varied hardware implementations, if they’re to be considered conscious, then we must be dealing with an information processing concept. Consciousness must be related to the flow of information through matter. It’s interesting to speculate about it, but I never felt confident in the idea. The philosopher John Searle argued that it’s all brain chemistry, so there are varied opinions. I do feel that our brains are processing information like a computer, but when it comes to us human beings and why we’re conscious, after listening to Terence McKenna, I’m feeling now that there’s much more to it. He did a lot of research into hallucinogenic drugs and personally tried them out on himself to observe their effects on his state of consciousness. I find it baffling. Take dimethyltryptamine (DMT), a naturally occurring neutrotransmitter/neuromodulater floating around in all of us. 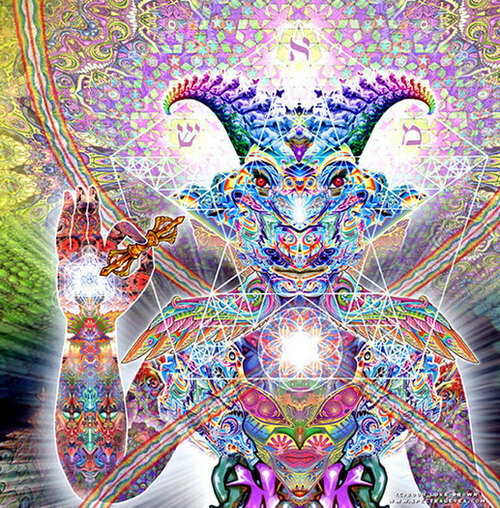 Smoke some DMT and this chemical will find its way into your synaptic clefts and BOOM. Within 30 seconds your body dissolves and you end up in another dimension, surrounded by beings of great intelligence who try to establish communication. Now I don’t recommend people go out and do this stuff. I never would. But here’s the greater question. Why does that chemical cause this wild effect on our consciousness? Why would you be transported to the “dome” and see beings which look like this? You’ll say, “He’s hallucinating! Of course he’d see wild things!” But you’re missing the point. Why do different chemicals and electrical signals within the brain give rise to the subjective experiences they do? Our society has a stigma against drugs of all kinds, and a lot of it with good reason. But we must remember, the brain is a chemical vessel. It’s biology. Why does this chemical do this? The same goes for LSD, shrooms, or any other mind altering substance. I suspect there are great mysteries we haven’t even begun to discover. We have no clue what we are or what’s going on. You know, I was thinking about it just yesterday. If our subjective consciousness was solely an information process, and you muddled up the flow with this DMT, you should just get static and noise. Your conscious experience, if anything, should be like the white noise on a television set without an input signal. Then when the drug gets pumped out, the “picture” should fade back in. Even so, I can’t make heads or tails of it. Those simple ion pumps and channels within our brain’s neurons are doing all of that? It doesn’t seem real. I don’t want to believe it. Something so simple can’t give rise to all of that?! But it does. Somehow. McKenna had an interesting take on what this human experience is. He called it a “controlled hallucination”. That just makes me smile. Our bodies hold us in this experience we call life, and it’s not much different than a controlled hallucination which loses its hold when we go to sleep at night.